Surprise candidate. It doesn't always have to be a Latitude, ThinkPad or EliteBook when thinking about a professional laptop. Samsung sends a well bundled package into the race with the Series 6 test model, which competes against the established competition. We exhaustively tested whether it is successful in every field. The manufacturers handle the business divisions very differently. While, for example, Sony no longer features a declared business series in its product line, other manufacturers such as Lenovo are slowly but steadily increasing their portfolio. 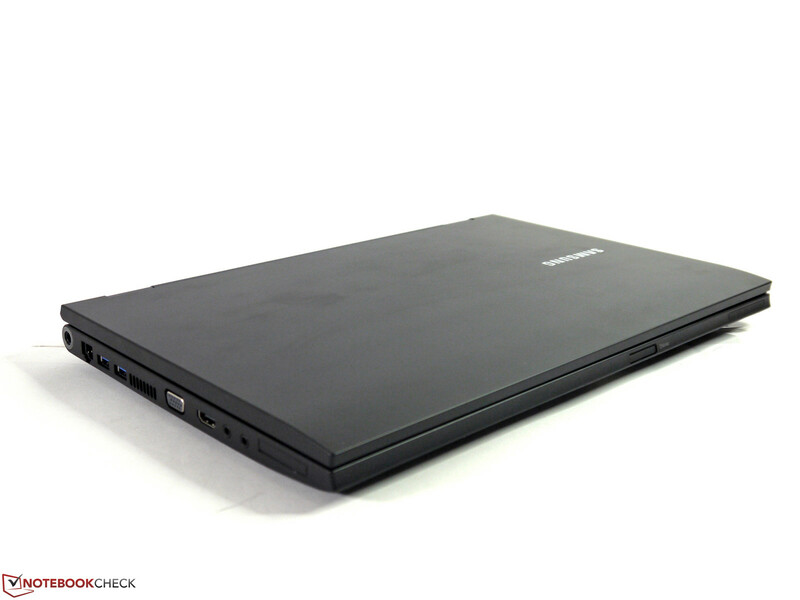 Also, niche brands like Schenker try to penetrate the business sector with relabeled consumer laptops. They are attractively priced and offer flexible configuration options. Samsung has a genuine business line in its range with the Series 6. It is not a makeshift solution but a product line consistently designed to meet professional needs. Configuration details, such as extensive security features, a docking port or professional graphics solution, underline the ambitioned claim. 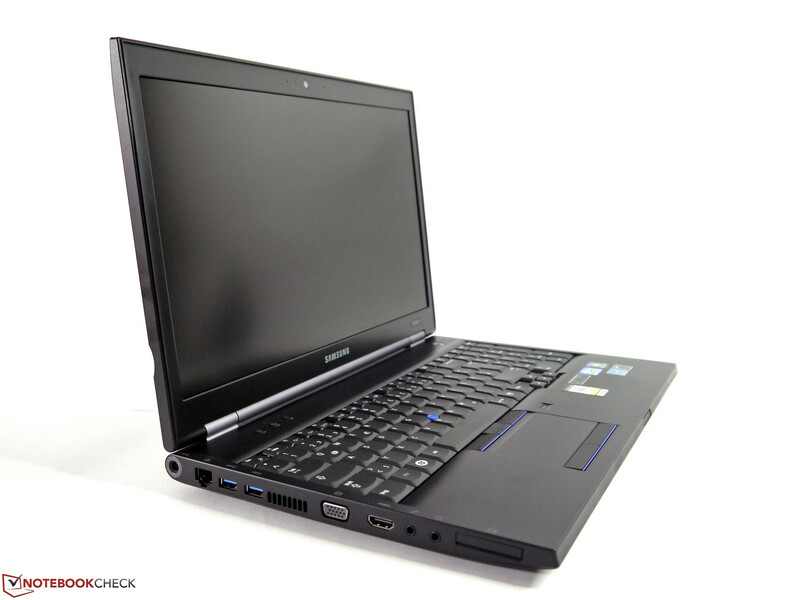 Our test model sports Intel's Core i7-3520M CPU, Nvidia's NVS 5200M graphics, 8 GB of RAM, a 128 GB solid state drive and an HD+ screen. Samsung still installs a Windows 7 operating system and thus respects the current wish of many companies. Samsung heralds a high rigidness and longevity on its product website. The casing's special magnesium alloy structure is also allegedly built according to high quality standards. 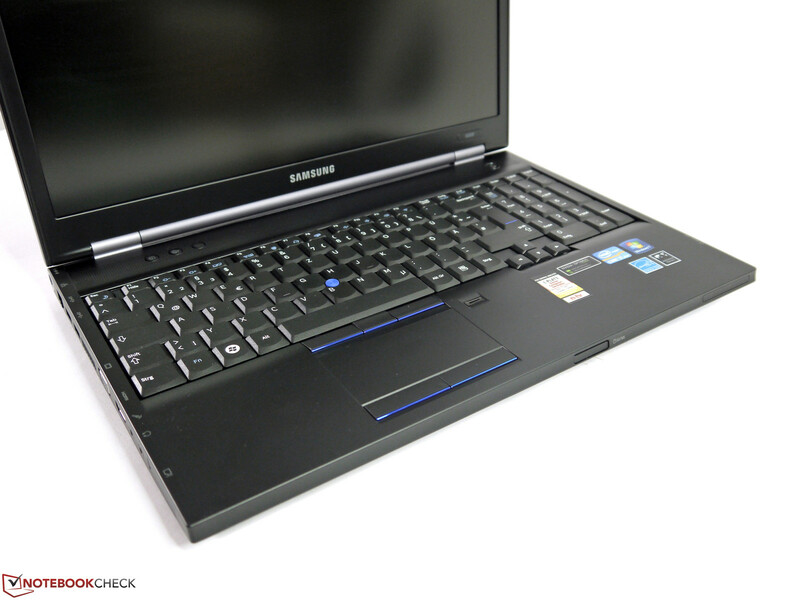 The casing of Samsung's Series 6 600B5C makes the impression that it is quite able to compete against contenders from Dell, Lenovo, HP and Fujitsu at first glance. 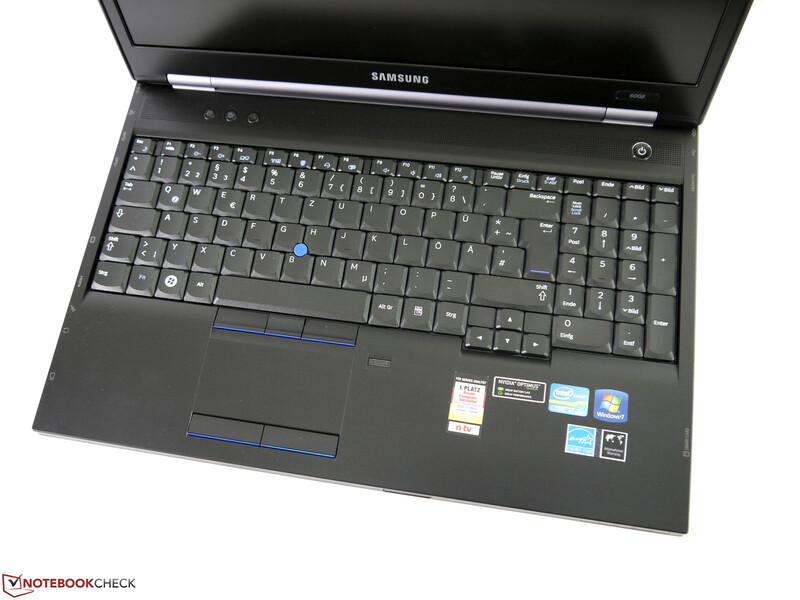 Compared with the former Samsung 600B5B featuring Intel's Sandy Bridge, nothing about the design or build has been visibly modified. The parts have a flush fit, the gaps are even and the surfaces make an easy to clean impression. The casing's gray business color does not feature many gimmicks and offers a sufficient amount of understatement. The blue metallic rims on the touchpad, the pointstick button area and the lilac-colored display hinge cover does not really match to that. However, that is as usual a matter of taste. The casing's stiffness does not quite achieve that which could be expected based on the advertising slogan. The base unit can be twisted to an extent when it is pulled and pressed; the display rocks visibly and the wrist rest's right dents noticeably under medium force. We did not try whether the casing can really defy a pressure of 500 kg. 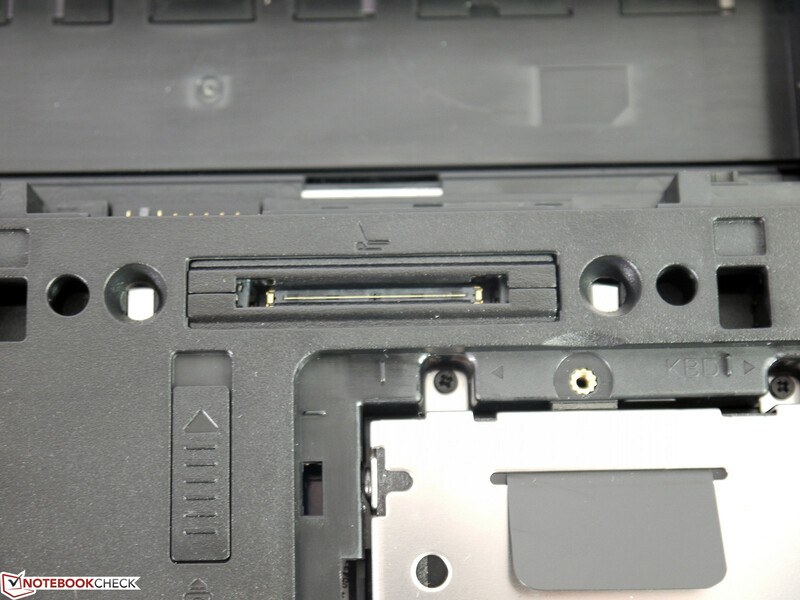 However, the areas above the optical drive and battery compartment are slightly more stable than often seen among the competition. 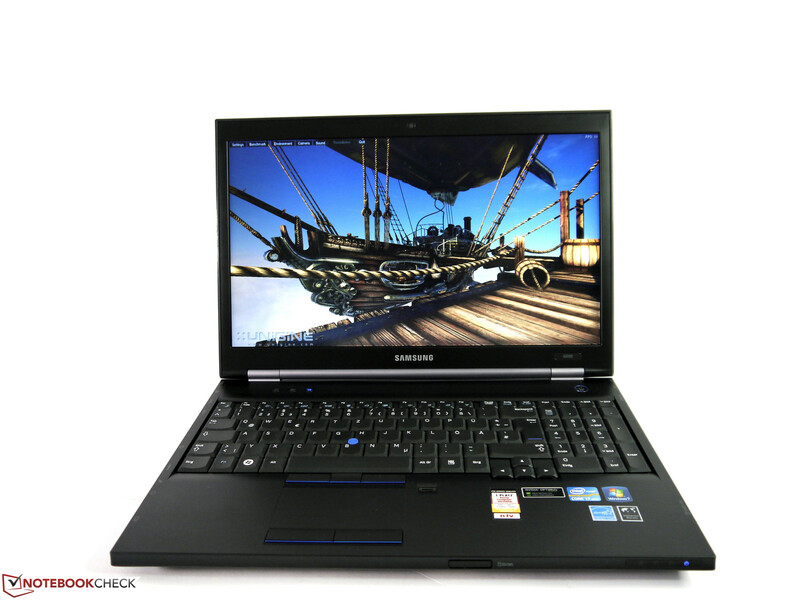 Compared with other business laptops, Samsung's Series 6 600B5C is roughly on a par with the Asus Pro B53V. 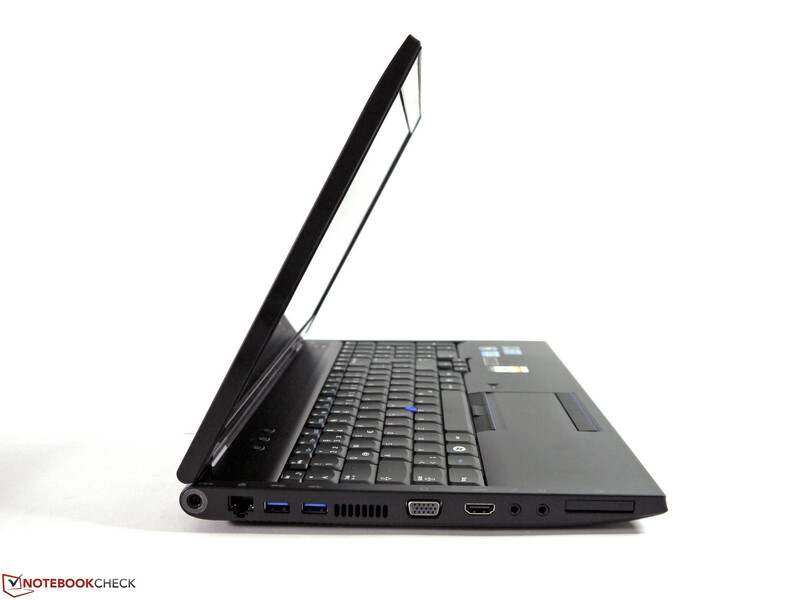 The category leaders, for example Dell's Latitude E6530 and HP's EliteBook 8570p, achieve a much better casing score. 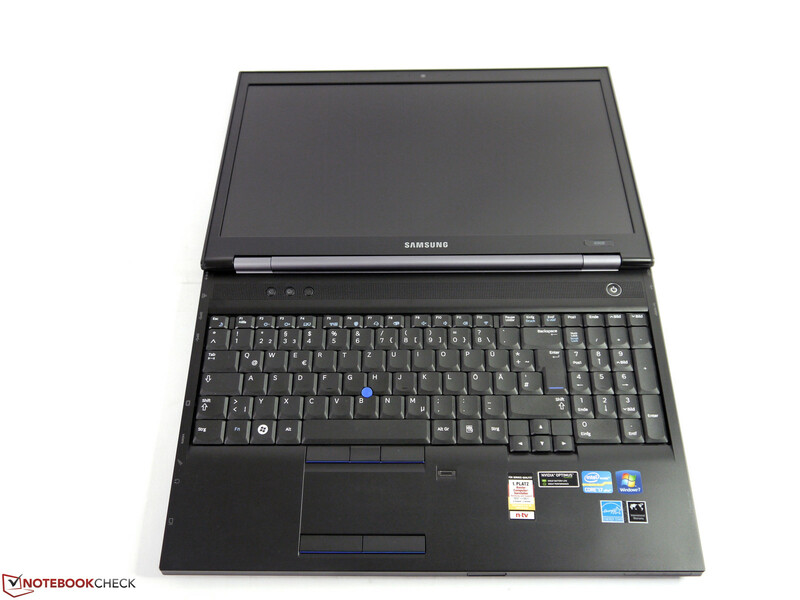 More impressions regarding the casing quality can be taken from the review of Samsung's Series 6 600B5B. 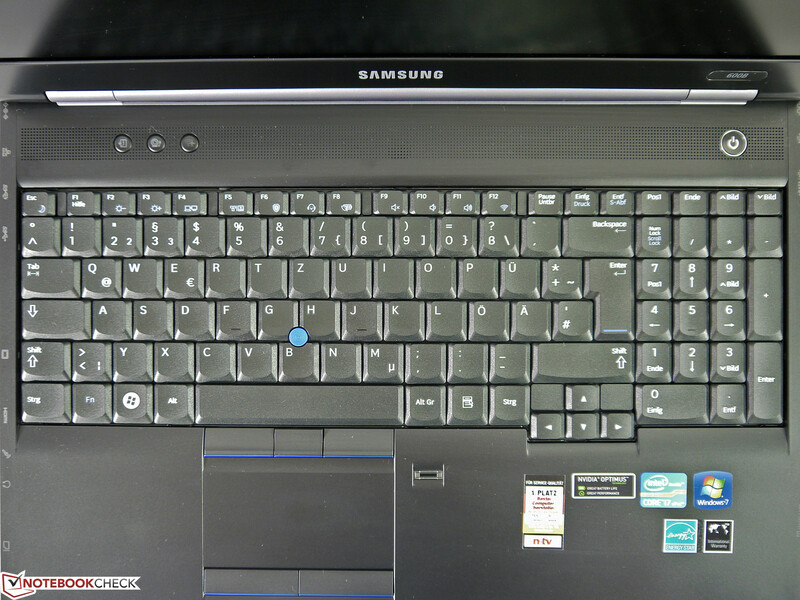 Samsung's 600B5C's casing features many of the interfaces that a business laptop requires in a competitive business environment. 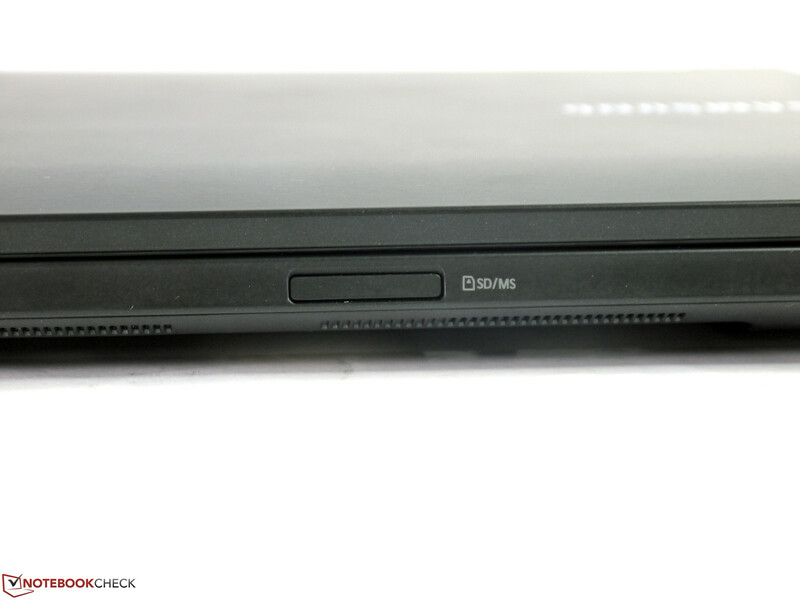 USB 3.0, eSATA, VGA, HDMI and an ExpressCard 34 slot cover a wide range. Fast, external storage devices can be connected via eSATA or USB 3.0 and external monitors can be linked either via analog VGA or digital HDMI. However, the device does not feature FireWire 400 or a DisplayPort. Other interfaces can be added via ExpressCard 34 or Samsung's Business Dock II. Samsung's AA-RD7NDOC docking station for approximately 170 Euros (~$218) adds a DisplayPort or even a DVI port besides the usual standard interfaces. The former Samsung Series 6 600B5B's AA-RD4NDOC docking station for approx. 140 Euros (~$179) can also be connected. However, it does not add USB 3.0 ports. The interface positioning is mostly good. LAN, USB and eSATA are in the casing's far back and thus do not disturb when external devices are connected. However, the positioning of the ports in the center left could impair workflow to quite an extent when external monitors are often used. The corresponding cables are exactly in the hand's workspace. 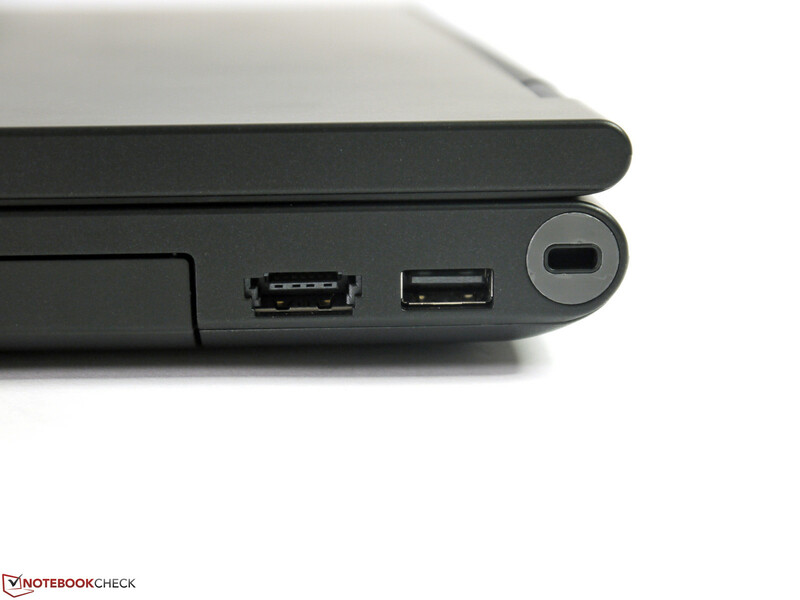 The tight spacing between the USB ports could also be limiting. The neighboring port is blocked when broader extensions, such as DVB-T receivers or USB flash drives, are inserted. 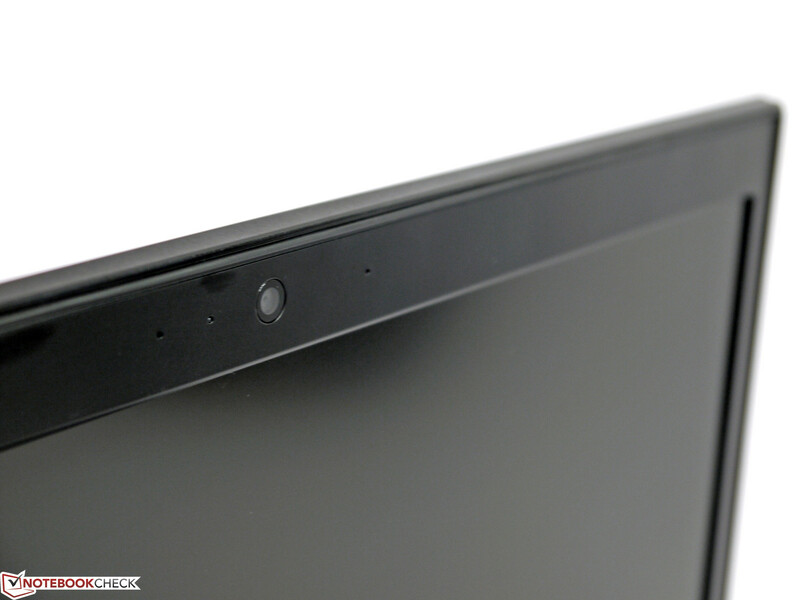 The VGA port transmitted an overall good picture to an Asus PA238Q screen in the native Full HD resolution, although with a barely visible blurriness. 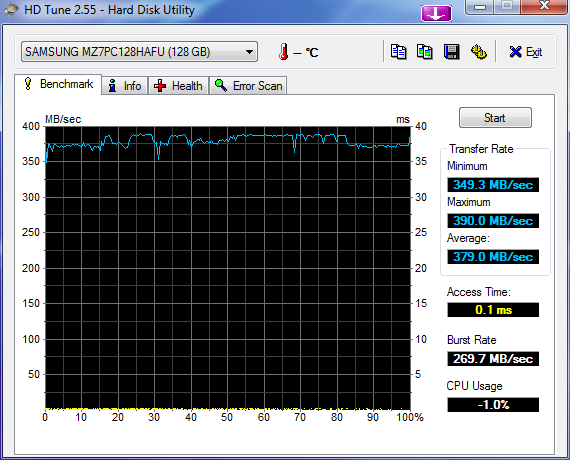 We could exhaust the performance of a solid state drive via USB 3.0 and achieved a transfer rate (seq. read) of 238 MB/s. Secure Bluetooth 4.0 and Intel's Centrino Advanced-N 6235 Wi-Fi module are available for wireless connections. Intel's Wi-Fi solution can theoretically transmit up to 300 Mbit/s, has 2 antennas and covers both the 2.4 GHz band and 5 GHz band. We ascertained the usual connection quality in the practical test. It enables a slightly further and more stable connection than the Atheros module in Asus' N76VZ. Samsung also installs Intel's WiDi standard as another feature, which enables connecting external screens wirelessly. We did not try this. The test device does not sport a WWAN module and it does not seem to be intended. In any case, there is no corresponding slot or another fitting place for that. 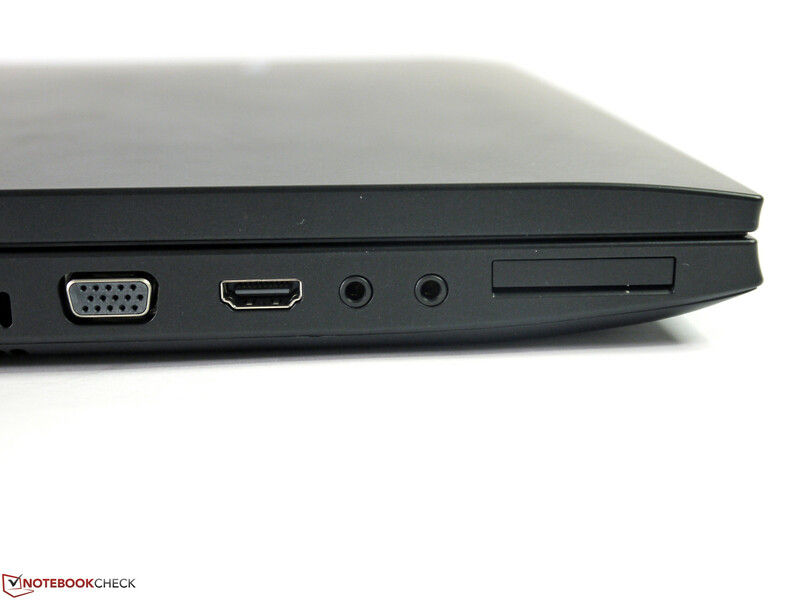 A 1.3 MP webcam, sufficient for video conferences, and a Gigabit LAN port complete the communication configuration. 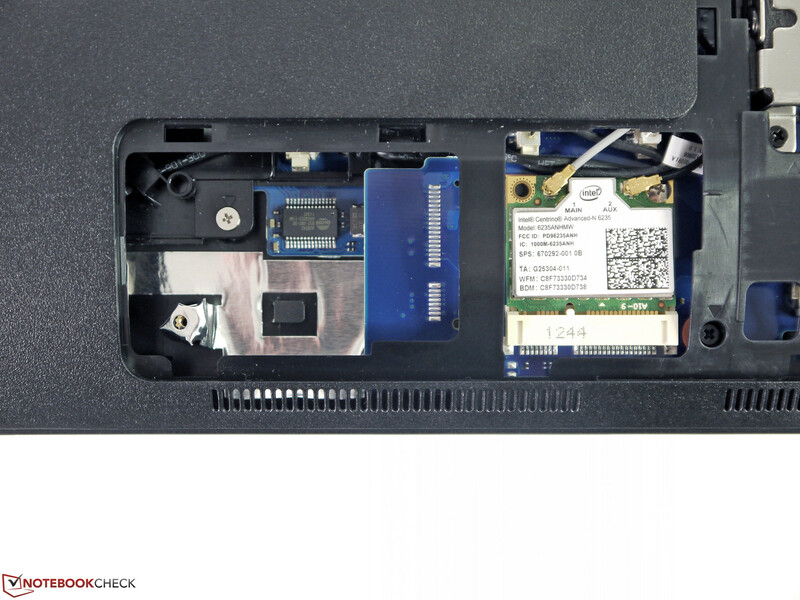 Samsung doesn't miss a trick when it comes to security and installs many things that the competitors also offer: a Trusted Platform Module from Infineon, Intel's Active Management System, Intel's Anti-Theft, various BIOS, hard drive and Windows password options, a Smart Card reader, fingerprint scanner, Samsung's Recovery 5 and Softex Omnipass password manager. 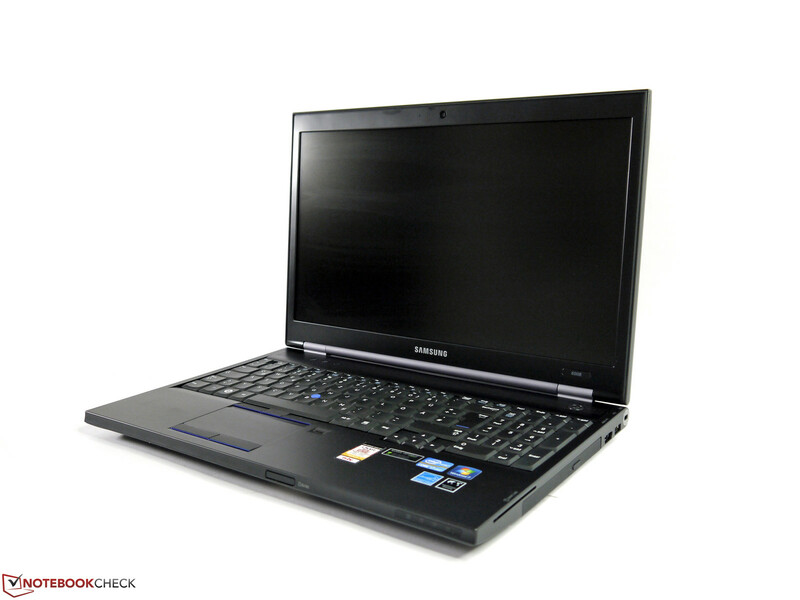 The BIOS is opened by pressing F12 during the booting process. Depending on the security requirement, Samsung's 600B5C features a wide range of options that allow adequately securing private or business data. 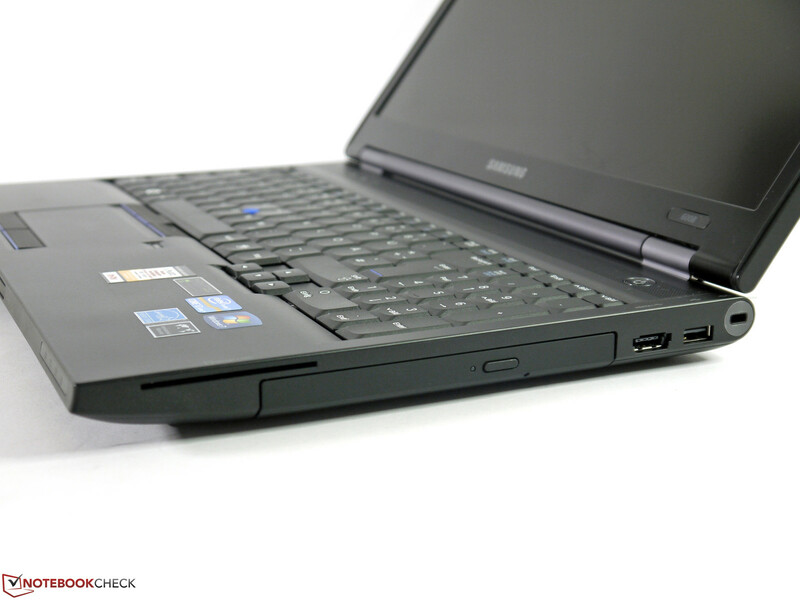 More about security solutions for laptops can be read in our related FAQ article. 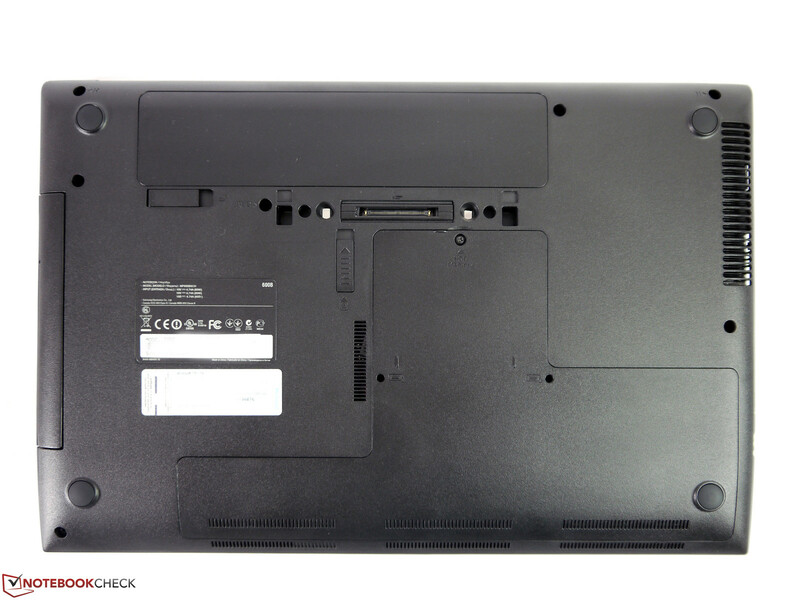 The wireless module, storage device and RAM components can be accessed via the big maintenance cover on the bottom. 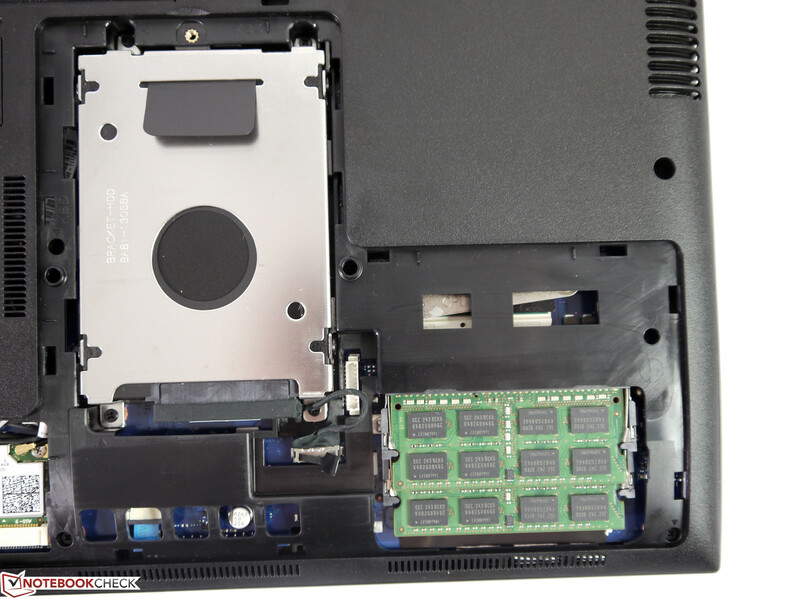 The optical drive is a module and can be easily removed after releasing the locking slide. The eject button for the drive is also well palpable and does not turn into a tedious task as known from some other contenders. Samsung apparently does not offer any alternative modules for this bay. We did not find a corresponding module by Samsung or another supplier. The fan cannot be accessed via the maintenance cover. The base unit has to be taken apart to access deeper-laying innards. This could lead to a loss of warranty. 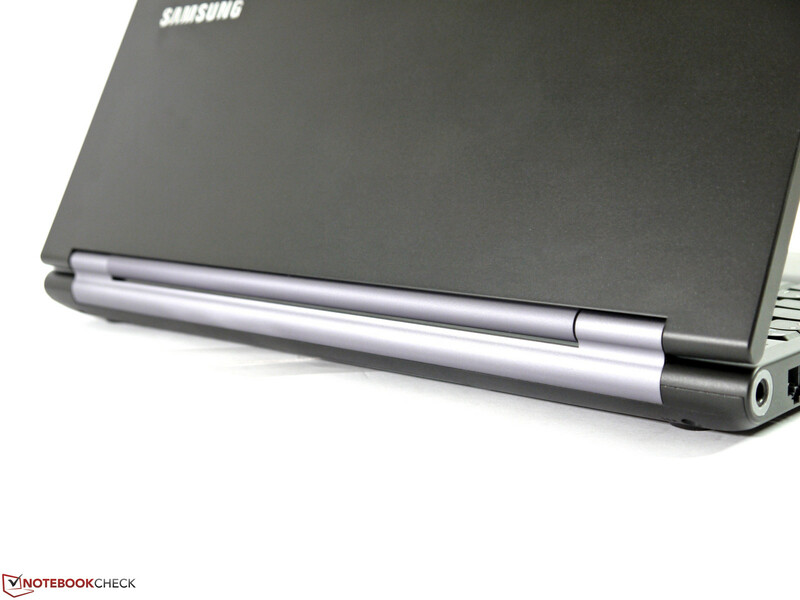 Samsung standardly includes a 2 year on-site warranty for its Series 6 laptops. It can be upgraded to 36, 48 or 60 months. For example, a warranty upgrade to a 5 year on-site service is available for approximately 260 Euros (~$334). These upgrades are only possible for 90 days from date of purchase. The keyboard unit has a tight fit over the entire area and only yields marginally in the upper left third. The keys feature a medium drop, a well-defined pressure point and quiet stroke. 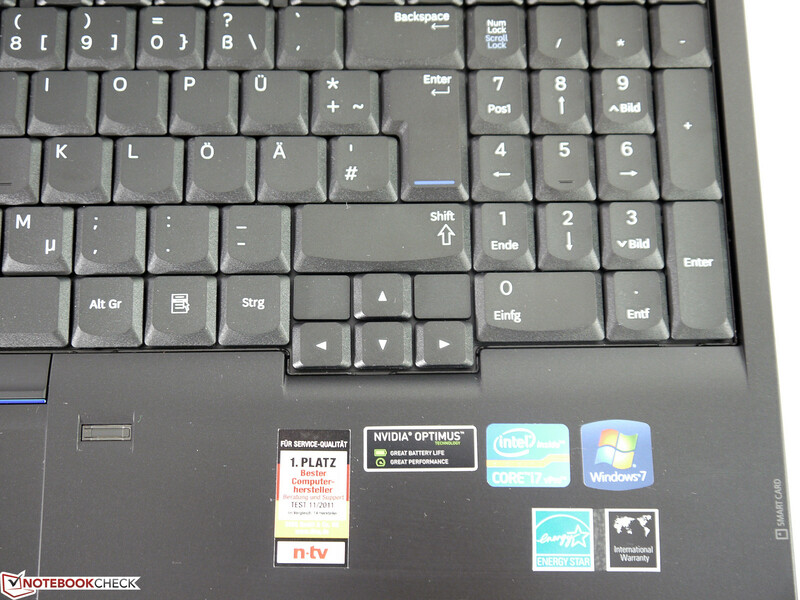 The main input field is arranged in a 19 mm grid and frequently used keys, such as space, tab and backspace, are sufficiently sized. The main lettering is rich in contrast. The FN combination implemented in bright blue and the light gray interface position marks on the sides are not as clearly visible in poor light. A backlit keyboard is not available. The 86 x 44 millimeter touchpad is sufficiently sized and usually allows executing multi-touch gestures without mistakes. The gliding trait is good and inputs are implemented reliably. 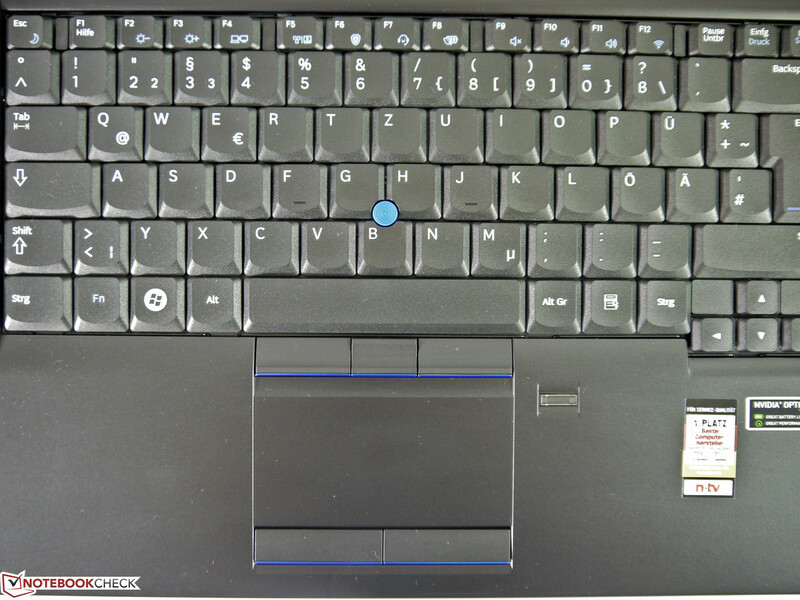 The dedicated touchpad keys work perfectly and do not give reasons for complaint. 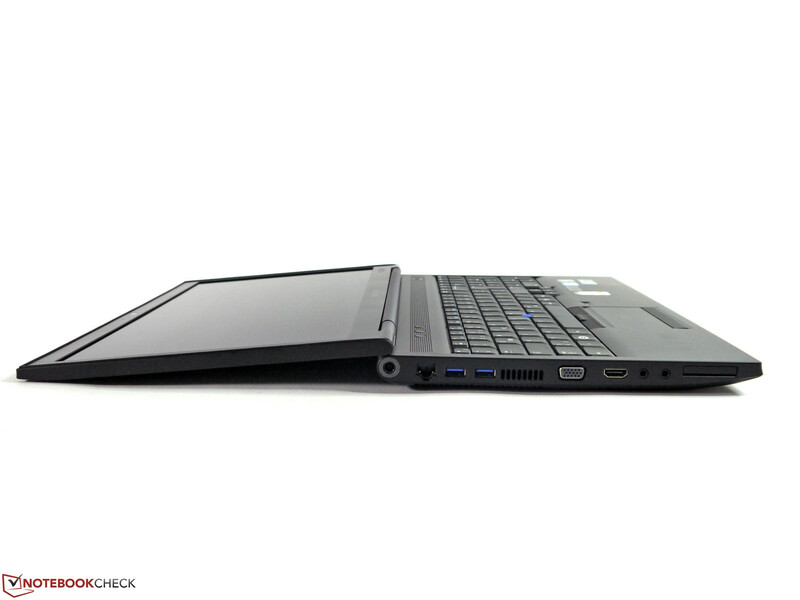 Only the surface feel is not as pleasant as for example in HP's EliteBook 8570 that features a rubber-coated texture. The trackpoint is basically very accurate but the concave surface is subjectively a drawback. It often seems that the finger will slip off of the control. The contenders with a convex-shaped knob provide more comfortable navigation and better feedback. The included replacement tips feature the same shape. Samsung either installs a WXGA screen or, like in our case, a HD+ screen in its Series 6 models. Both screens are illuminated by white LEDs, feature a matte surface and are based on TN technology. 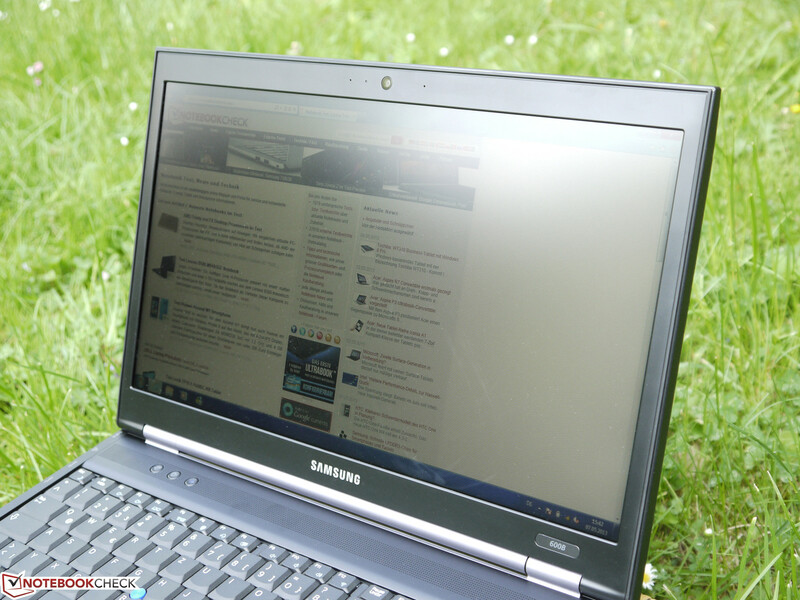 Our test model has a pixel density of 117 dpi, which is a good ratio of desktop and content size. 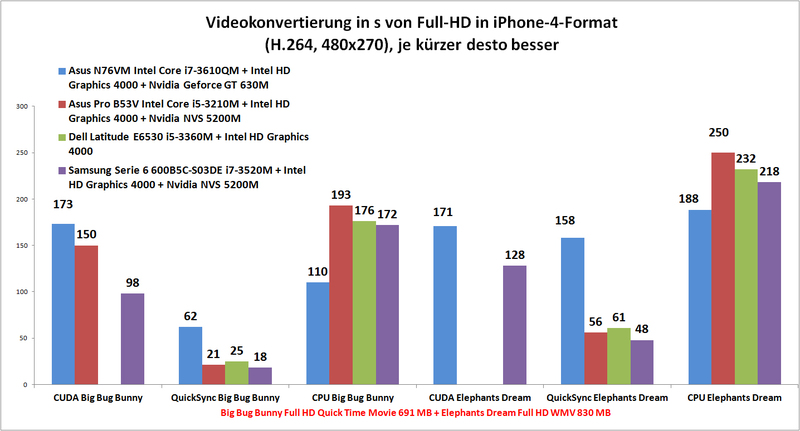 Full HD screens have a much higher resolution, but they are not available for the Series 6 models. 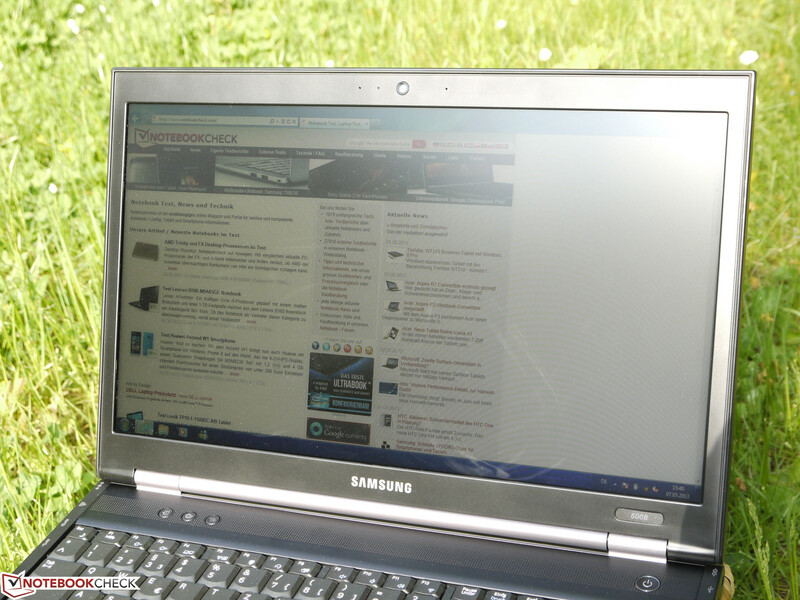 Samsung promises a brightness of 300 nits (cd/m²). We did not measure this rate anywhere on the screen. Although the rates of 228 cd/m² to 277 cd/m² that we ascertained are in no way bad, they are remote from the Korean manufacturer's promise. We ultimately recorded an average brightness of 247 cd/m². The illumination of 82% is also only average. A light clouding is visible on unicolored content. However, that barely affects practical use. 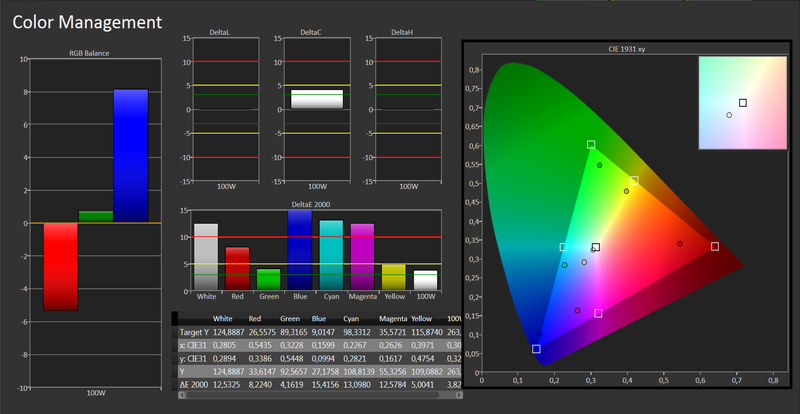 The brightness can be adjusted in 8 levels and covers a brightness range of 17 cd/m² minimum and 247 cd/m² maximum (measured in the screen center). An ergonomic indoor brightness of approximately 150 cd/m² corresponds to level 6. Owing to the matte surface, reflections are not an issue. This has a particularly positive effect in outdoor use where reflections would be predominantly noticed due to the bright lighting situation. The maximum brightness is not reduced in battery mode and is available to the user. That ensures an overall good legibility of contents. Only direct sunlight or other unfavorable seating positions are very limiting on usability. The weak contrast of 142:1 is not as competitive. Colors looks pale and deep black is not achieved. Although that is adverse in movies, videos and games, this drawback is largely relativized in word processing, spreadsheets and internet use. The HD+ screen in HP's EliteBook 8570p or the Full HD screen in Dell's Latitude E6530 visibly score much better in this assessment. 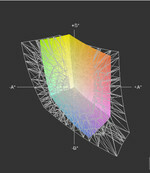 The sRGB color space is covered to approximately 60% and is thus hardly recommendable for professional image and graphic work. 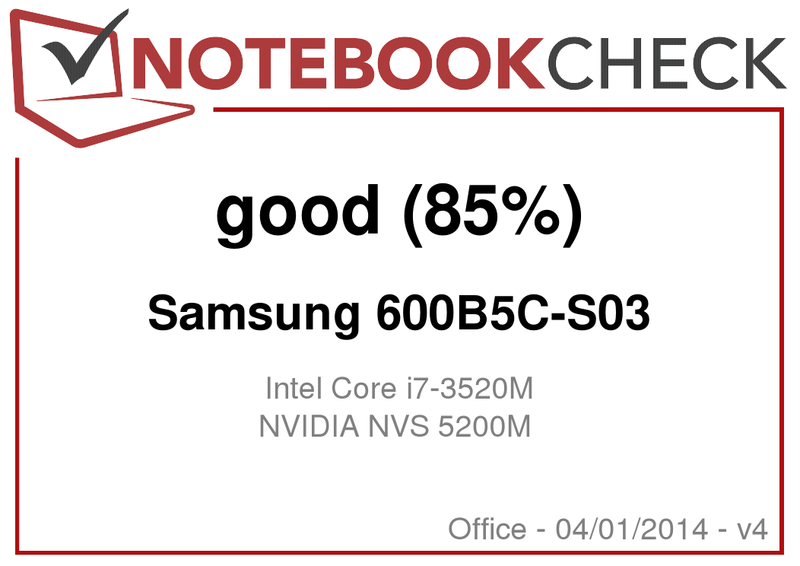 Samsung's screen does not score well in the other quality assessments. 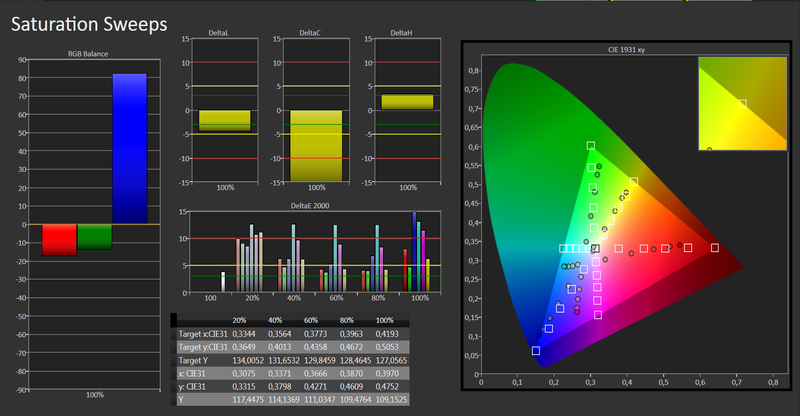 The grayscale resolution, color accuracy and color saturation exhibit great deviations from the ideal. The screen's potential can first be used after calibrating it. While a very good result is achieved in the grayscale with an average DeltaE 2000 of 2.05, the improvements in color accuracy and saturation are not as high as would suffice for professional use. The deviations are still too high in many color ranges and thus clearly visible. The viewing angle stability is especially weak on the vertical plane. An ideal image is only displayed when the screen is slightly tilted toward the back in a narrow range of approx. 95 ° to 105 °. The contents fade or start to invert outside of this field. The image remains considerably more stable horizontally although it dims slightly toward the sides. While this effect is barely noticed adversely indoors, it results in a limited legibility from lateral seating positions outdoors. 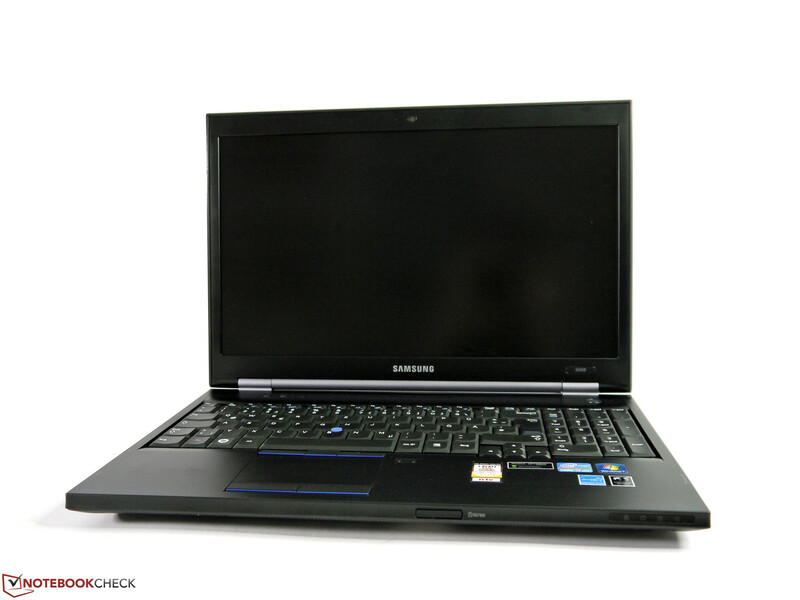 The three different Samsung Series 6 600B5C models currently available only vary in CPU, graphics, RAM and/or storage device configurations. 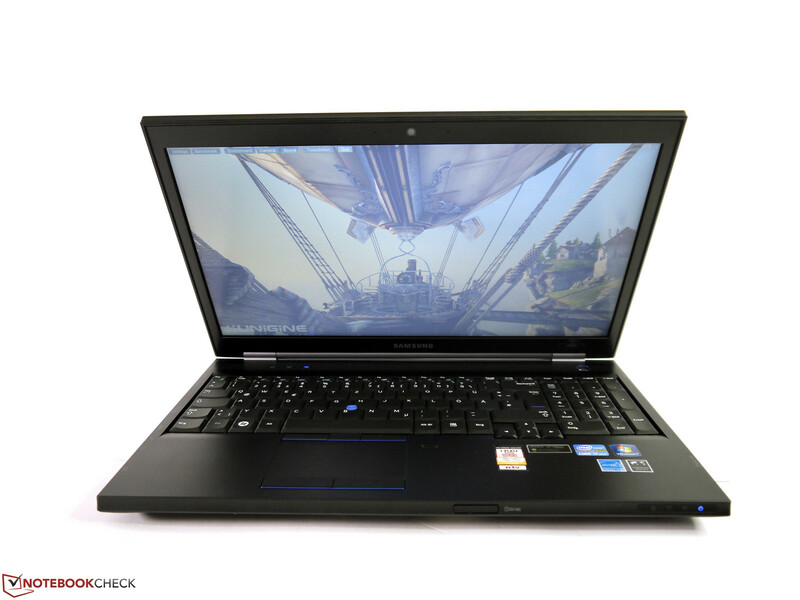 The premium model we tested sports Intel's Core i7-3520M, Nvidia's NVS 5200M, an HD+ screen and solid state drive and is surprisingly much cheaper than a version with Intel's Core i5-3320M, Intel's HD Graphics 4000 and a WXGA screen. Thus, the test model lures with a promising performance and awakes hope for low emissions and consumption rates with a solid state drive and Nvidia's Optimus. A current street price of about 950 Euros (~$1221) is an additional buying incentive and can only be okay with business customers. 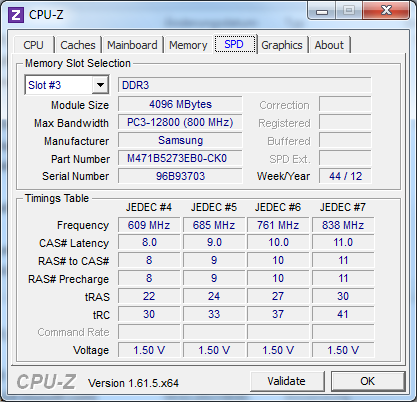 Samsung installs the currently second fastest dual-core CPU in the test model. 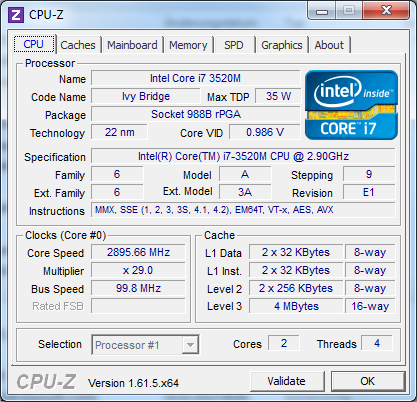 Intel's Core i7-3520M achieves a maximum clock rate of 3600 MHz in single-thread processing via Turbo Boost 2.0 and features a nominal clock of 2900 MHz otherwise. Providing that the computational load can be distributed over multiple cores, up to four threads can be processed simultaneously via Intel's Hyper Threading technology. Both of these technologies ensure optimum performance development. In contrast to quad-core CPUs, the swift dual-core particularly benefits from the high clock in single-thread operations. For example, our test model achieved 4837 points in Cinebench R10 32-bit Single, whereas Intel's Core i7-3610QM quad-core CPU settled to 4422 points on average. We tested this by converting an audio file via iTunes. 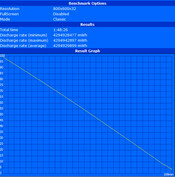 Intel's Core i7-3520M CPU achieved an x50 speed and Intel's Core i7-3610QM an x47.1 conversion speed. The Core i7-3520M processor's limits are ultimately found in extensive multi-thread operations. 10265 points versus 17265 points from the i7-3610QM in Cinebench R10 32-bit Multi. This is particularly noticed when software that can distribute the computational load over as many cores as possible is used in practice. This is, for example, the case in video converting and rendering tasks. The dual-core solution also lags behind when computing-intensive programs run simultaneously. The test model needed 20-50% longer until a result was produced in pure CPU video converting via Cyberlink's MediaEspresso. Video converting is achieved much faster and with considerably less CPU load when the work can be transferred to one of the GPU-integrated video engines. Overall, the installed CPU's power is very apt for many application scenarios. A model featuring a quad-core CPU is only better for extensive multi-core operations or simultaneously running applications. 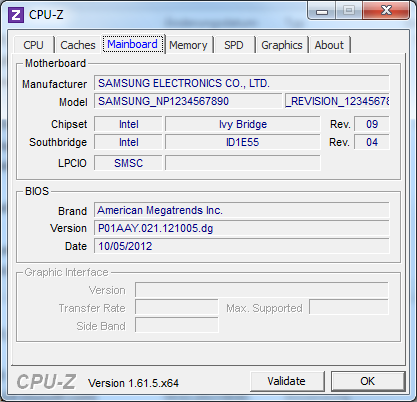 Such a processor is currently not available for Samsung's Series 6 business laptops. 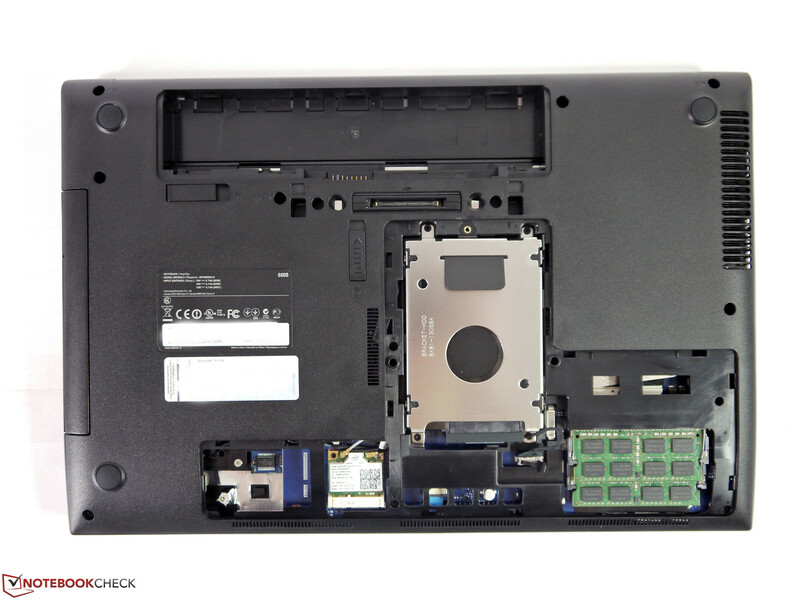 Alternatives featuring a quad-core would be for example Dell's Latitude E6530 or Lenovo's ThinkPad T530. However, this clearly increases the price and is not always proportionate to the achievable speed advantage. The installed components work very well together. Possible configuration-related weaknesses are not evident. Only a faster CPU, a stronger graphics chip or an even swifter solid state drive could improve the system's performance. The system easily copes with all tasks up to video converting. The graphics power is only too weak for high-performance 3D tasks, such as games, construction programs or 3D animations. The test device for example accomplished a very good 14918 points in PCMark Vantage. 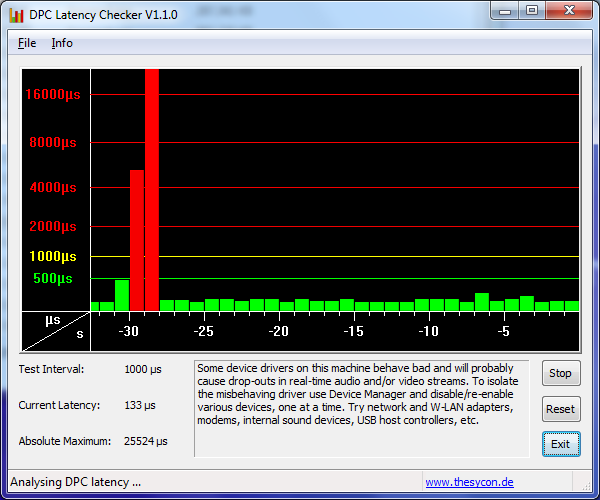 We examined the system for possible latencies when using external devices via DPC Latency Checker. Synchronization errors, dropouts and the like can occur when the latencies are too long. We noticed two high peaks that go far beyond the limit of 2000 µs in the first run. They could be eliminated by disabling the wireless modules. A future driver update should alleviate this. 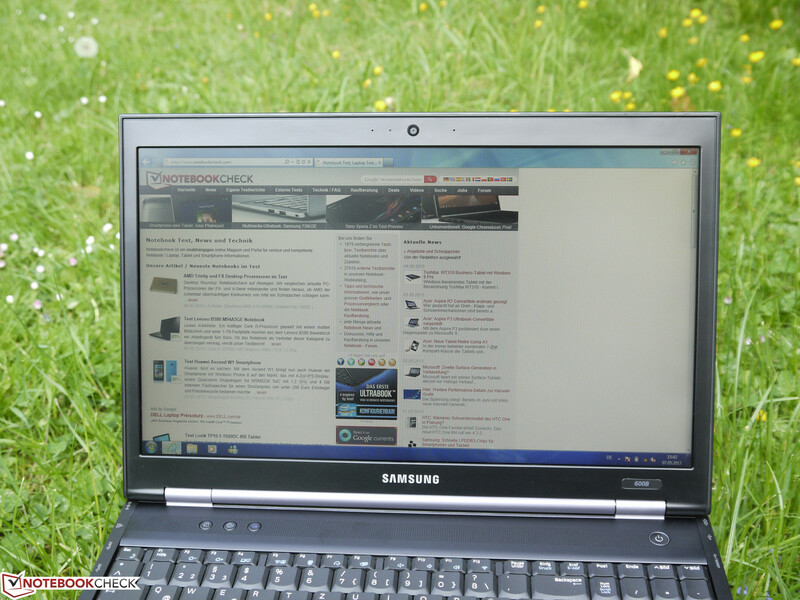 The test model sports a swift solid state drive from Samsung's own production line. Transfer rates, access times and the subjective speed are much better than known from conventional hard drives. The tight storage capacity is adverse for some application fields though. The storage capacity of 98 GB net is soon filled with a few programs, videos, pictures and maybe games. A second drive cannot be installed as far as we know. Neither an mSATA port nor a second storage device slot is available. We also did not find a matching caddy for replacing the optical drive. Users who want to upgrade the storage capacity will either have to replace the existing drive or use an external solution. Nvidia's Optimus technology allows Samsung to install two usable graphics chips in the 600B5C. However, it is a bit aggravating that the 3D performance of the dedicated Nvidia NVS 5200M is only marginally higher than that of Intel's HD Graphics 4000. This shortens the list of additional application fields considerably. Basically, only tasks that benefit from Nvidia's CUDA engine, multi-monitor use or a somewhat better 3D gaming performance are left. 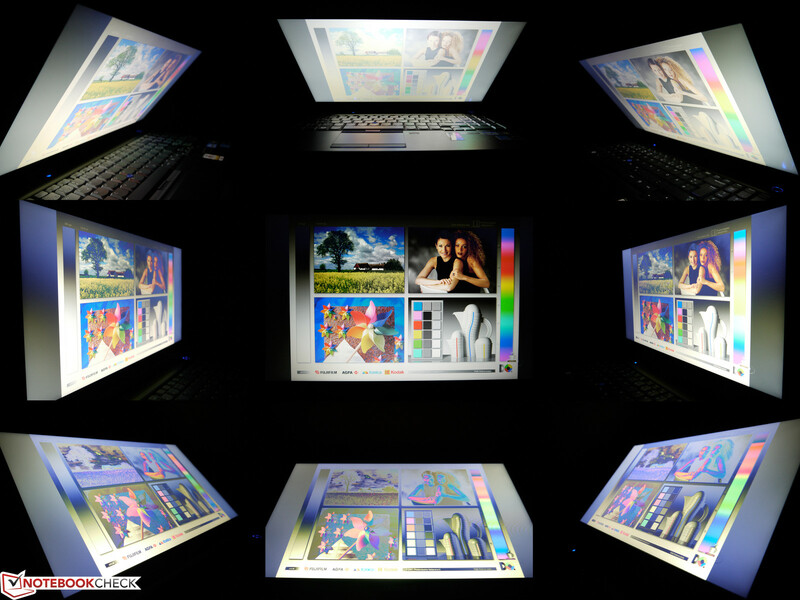 We could not ascertain to what extent the theoretically possible multi-monitor use of up to 4 displays can be implemented. According to the spec sheet, Nvidia's NVS 5200 can control up to 4 screens simultaneously and would need the docking station for this, like in solutions found in the competition. We could not test whether this is really possible due to the lack of equipment. Otherwise, Intel's HD Graphics 4000 is more than apt for most tasks. 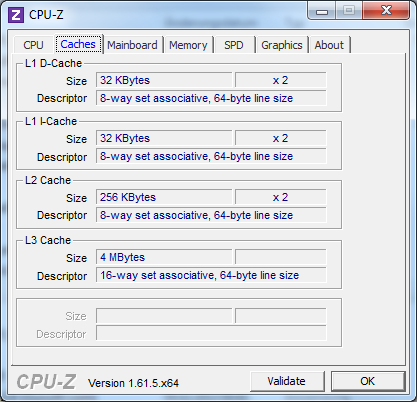 Owing to the reasonable memory capacity of 2x 4 GB, the graphics unit which depends on the shared memory method can develop its full performance. For example, we achieved 733 points in 3DMark 11. The much better score of 1047 points that Nvidia's NVS 5200M reached in 3DMark 11 only has a positive effect on games. It enables increasing the one or other quality setting a bit or opting for a higher resolution. The other scores, such as 25.5 fps in Cinebench R11.5's Open GL Shading or 13.5 fps in the Heaven 2.1 benchmark, show that generally only a rather low 3D performance can be expected. Both graphics cards support the OpenCL standard and also feature a few proprietary technologies, such as Intel's Quick Sync and Nvidia's CUDA. Computing tasks can be processed by the graphics unit rather than the CPU (GPGPU). There is quite a large scope of programs that benefit from this speed increase. 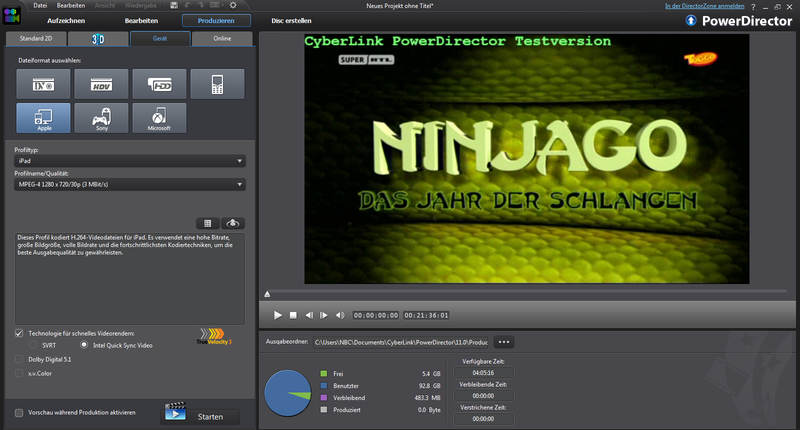 Video editing is faster for example in Sony Vegas Pro 11 or Cyberlink PowerDirector 11 and converting via Cyberlink's MediaEspresso or Elemental's Badaboom (now discontinued). 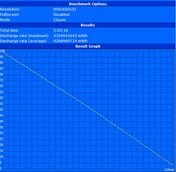 Photoshop CS6 and Gimp 2.9/2.10 use the GPU accelerator for some filters and WinZip 17 compresses data much faster. We did not ascertain a performance reduction in battery mode. Both 3DMark and Cinebench supplied virtually identical results. It is quite possible to play all tested games in minimum settings. Not every game runs smoothly in medium quality and resolution and requires the corresponding adjustment. The overall performance will certainly satisfy low demands. However, Samsung's 600B5C and Nvidia's NVS 5200 are not recommendable for regular gaming sessions. 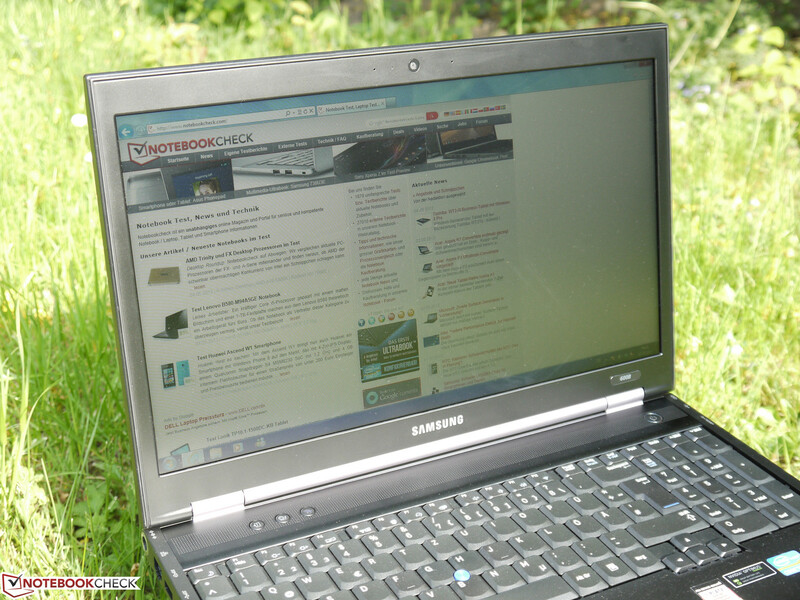 Samsung's Series 6 600B5C-S03DE is generally a very quiet laptop. 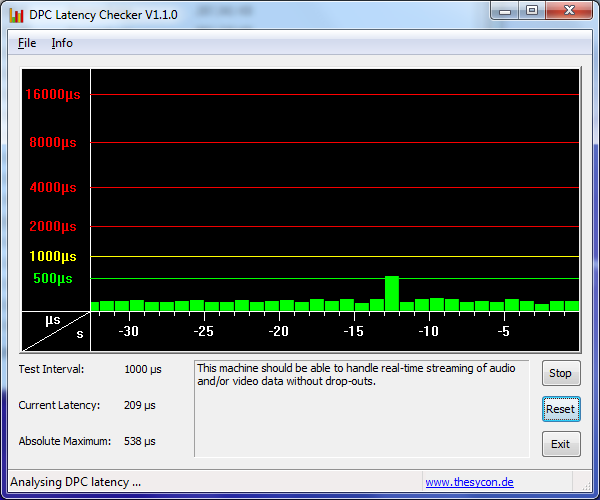 The laptop was silent in idle and we ascertained a noise level of 30.5 dB(A) during load when the fan sets in. Although that happens in regular periods, only very noise-sensitive users will likely find it distracting. However, Samsung also has a nifty gimmick for this group. Silent Mode can be enabled in Samsung's Easy Settings tool. 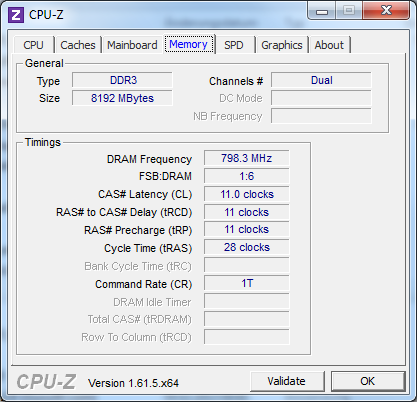 The CPU's clock is then only 1.2 GHz and Nvidia's NVS runs at 162 MHz. 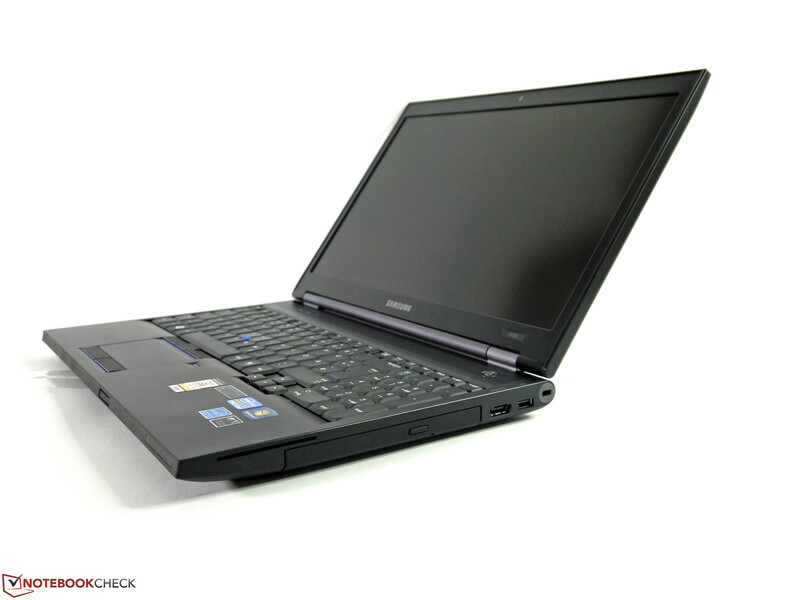 The laptop always remained silent no matter if a conversion or another performance demanding task was being performed. Naturally, the performance is reduced considerably. 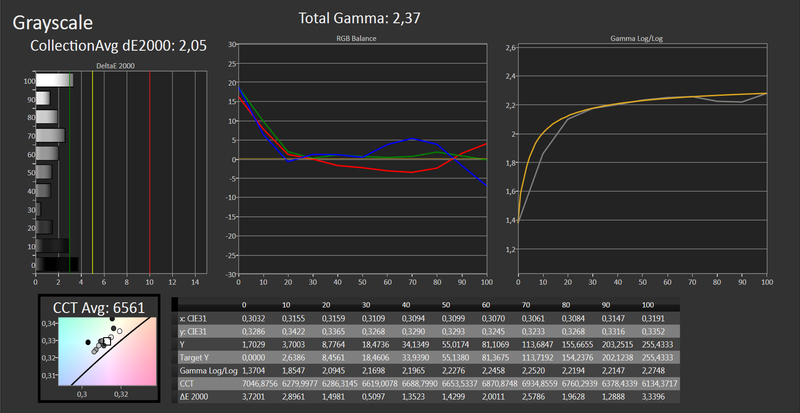 For example, Cinebench R11.5 64-bit only achieved 0.5 points (single), 1.1 points (multi) and 12.2 fps (OpenGL Shading). 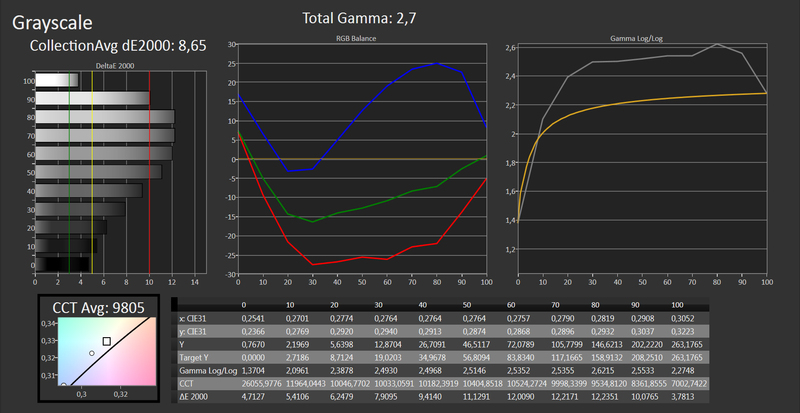 We measured 36.2 dB(A) during medium load and a maximum of 45.6 dB(A) in full load without Silent Mode. 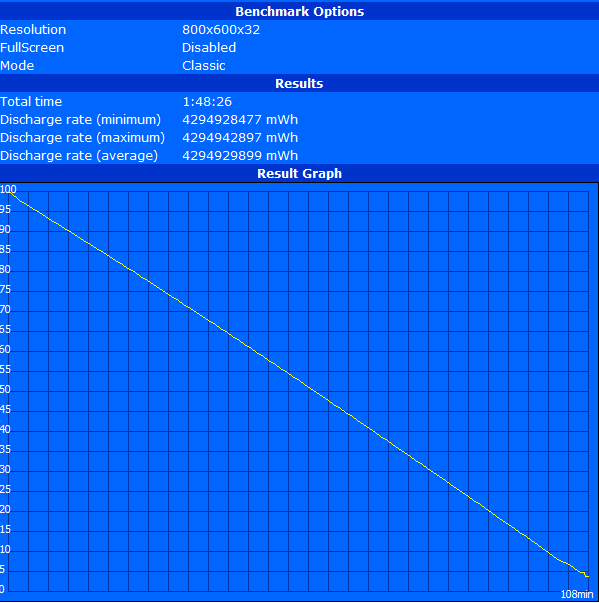 The cooling system quickly reduced the fan speed to 33.2 dB(A) and then finally to 30.5 dB(A) after full load. The temperature development can generally be classified as very low. Almost all areas of the casing remained below 40 °C even during full load. We only measured a disconcerting 51.2 °C in the area of the vent on the left back side and a hot 66.3 °C directly at the air outlet. The user should avoid contact with these areas during a longer full load period. 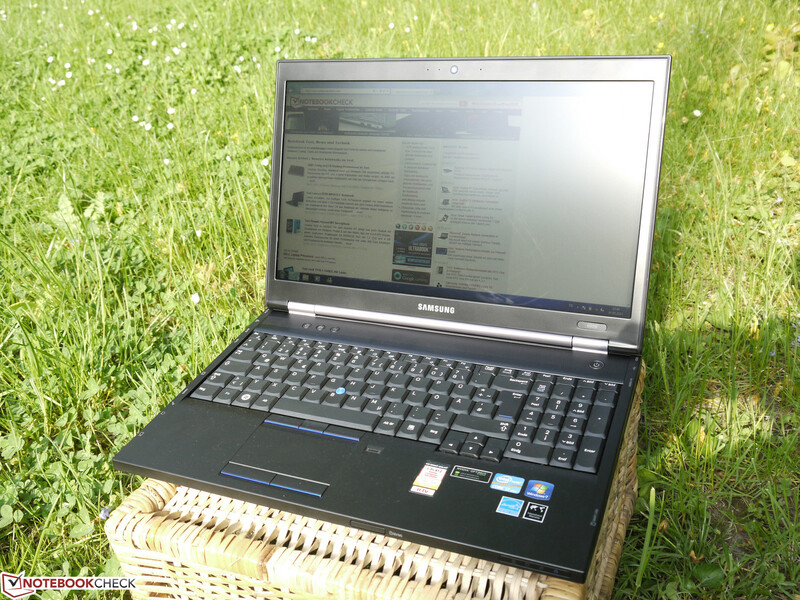 Samsung's 600B5C remained exceptionally cool during less demanding use and reached a maximum of 30.9 °C. We did not notice temperature-related throttling in the CPU or GPU. The CPU clocked steadily with 3.4 GHz and the GPU ran with 624 MHz even during permanent load via Furmark and Prime95. 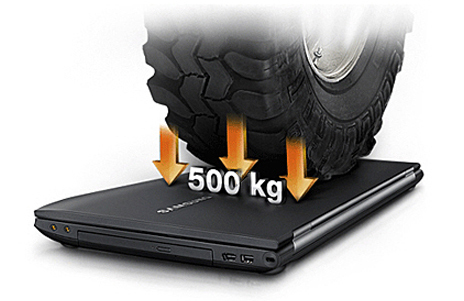 The speakers installed in the laptop only suffice for low requirements. The sound characteristic is very treble-heavy and lacks audible mids and basses. Although that is usually enough for a business laptop, an external solution should be used as soon as presentations are planned. External speakers can be connected via the 3.5 mm jack or USB. HDMI is also available for this purpose. We ascertained a power consumption of 8.4 watts up to 71.1 watts during full load at the mains. 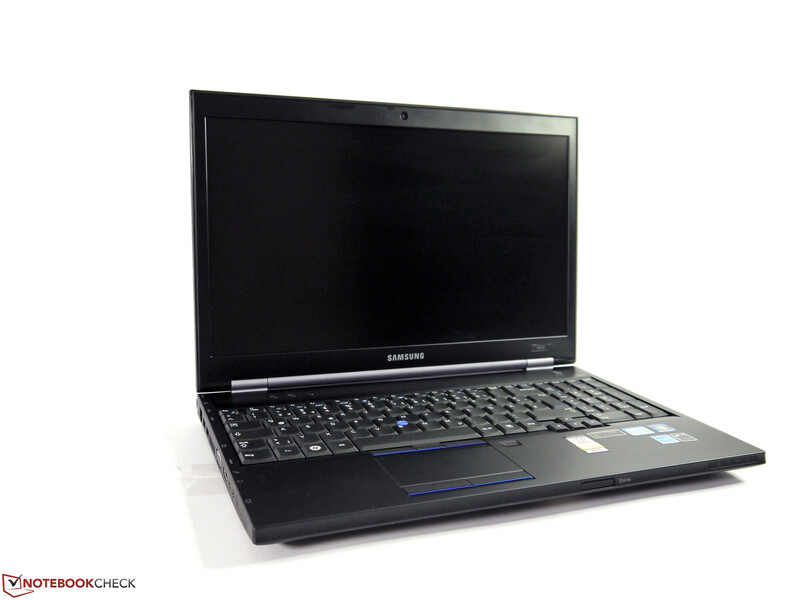 The fairly low minimum consumption is largely due to the available Intel HD Graphics 4000. The presetting Maximum Battery Life ensures a consumption advantage of about 1.5-2 watts in contrast to Nvidia's NVS 5200M. 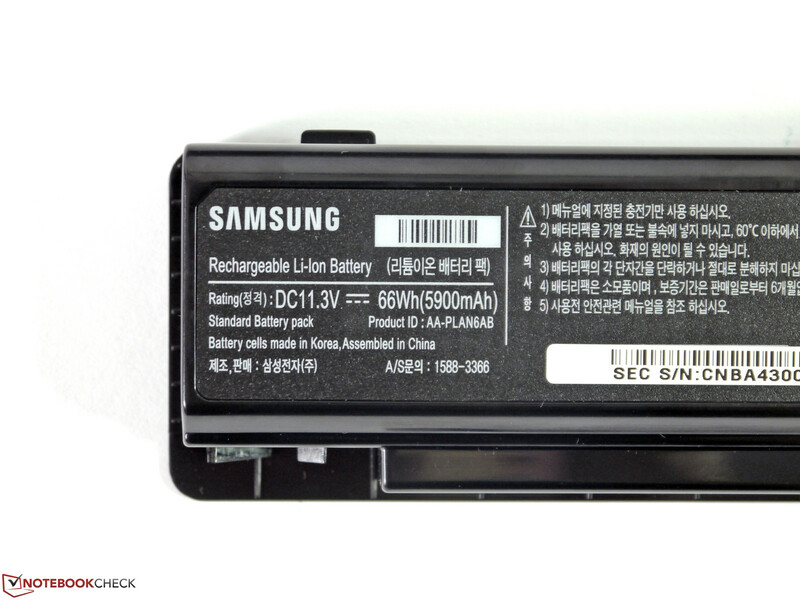 Samsung states a 6-cell battery with a capacity of 48 Wh in the Series 6 60B5C's spec sheet. However, a 6-cell battery with a capacity of 66 Wh was included for our test model. An optionally available long-life 9-cell battery is much larger than the one in our test model and lifts the laptop's rear considerably. It is priced at approximately 100 Euros, ~$128 (AA-PLAN9AB/E). Samsung's specifications about it are a bit contradictory. On the one hand, 66 Wh is specified and on the other hand 11.3 volts and 8850 mAh are stated, which would roughly correspond to 80 Wh. In view of the size, we would sooner believe the latter. 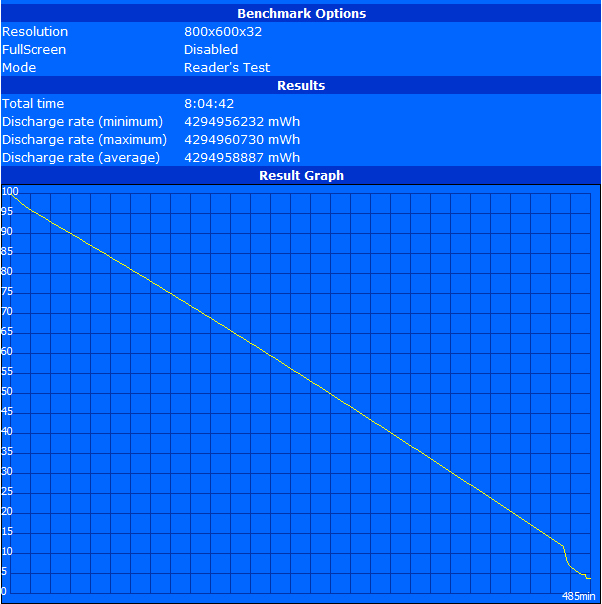 The battery runtimes that we ascertained are within the range that the technical data let us presume. The test device lasted for a bit over 8 hours in Battery Eater's Reader's test, which measures the maximum possible runtime using minimum screen brightness, disabled wireless modules and energy saving mode. The battery capacity was enough for about 5 hours of Wi-Fi surfing with a screen brightness of approx. 150 cd/m² and energy saving mode. DVD playback was possible for 4 hours using maximum brightness, energy saving mode and wireless off. Only almost 2 hours were left in Battery Eater's Classic test, which ascertains the minimum possible battery runtime via maximum brightness, all on and high-performance profile. This result is not expressive since we base this rate on the integrated Intel HD Graphics 4000. 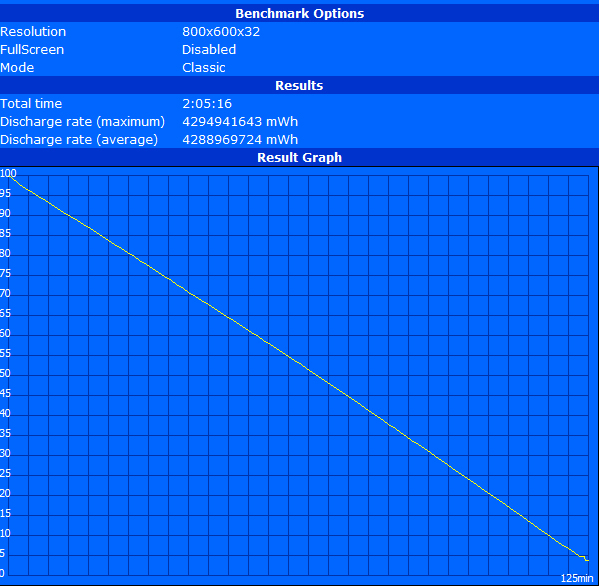 In contrast to our other tests in battery mode, Nvidia's dedicated NVS 5200M only clocked at 162 MHz. We assume that this is a uniqueness of Battery Eater's tools in conjunction with Nvidia's NVS 5200M. The 125 minutes of Nvidia's solution even surpasses the result of Intel's HD Graphics, which clocks at 650 MHz. The user should not reckon with more than an hour of full load runtime when the dedicated graphics card is used in practice. 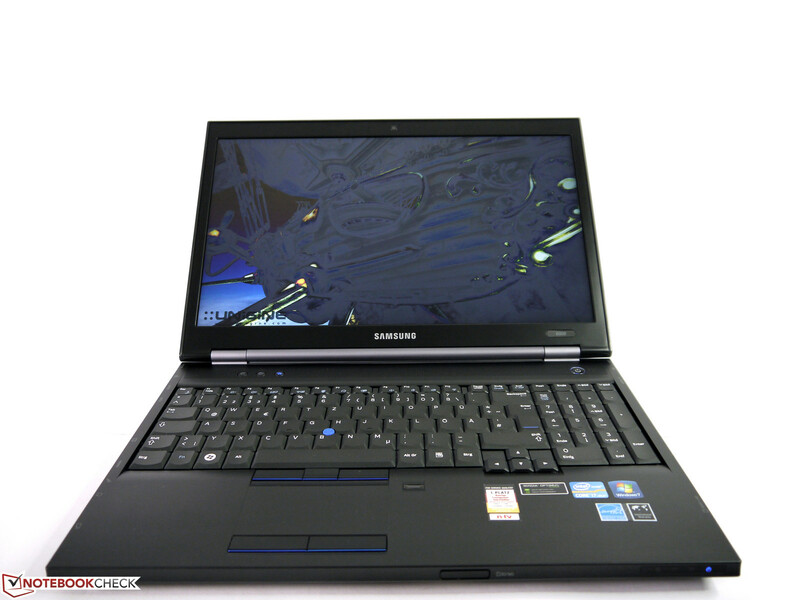 Samsung's Series 6 600B5C-S03DE is an attractively priced business laptop that can compete with the established contenders in many areas. The system performance, business features, battery runtimes and keyboard are a very good basis for many application fields. Even a couple of unique selling points are found in the test device. Silent Mode ensures a permanently quiet operating noise and the interface symbols on the sides facilitate finding the right port. However, compromises have to be made in other things, which ultimately prevent a better rating for Samsung's 600B5C-S03DE. While the partly yielding casing and the wobbly display are hardly noticed in stationary use, the viewing angle dependent and low-contrast screen are even more annoying. The internal expandability is also very limited compared to other devices from this category and thus not very competitive. Users who need special features, such as a backlit keyboard, WWAN module, quad-core CPU or a Full HD screen will not find these in Samsung's Series 6. Samsung's Series 6 represents the typical business category. and the business-typical configuration is extensive. 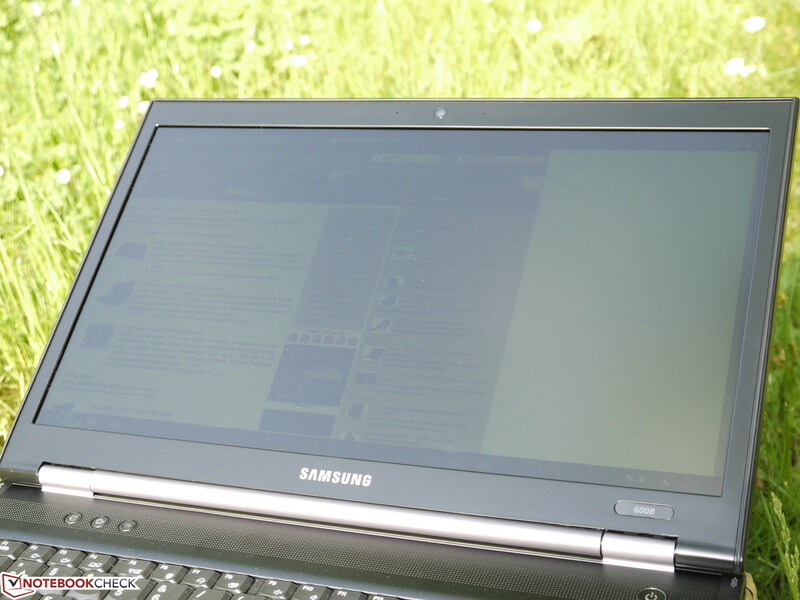 Working with a permanently silent laptop is possible when performance is waived on. The screen only offers the best possible quality in a very tight field of view. invert to the point of being unrecognizable. 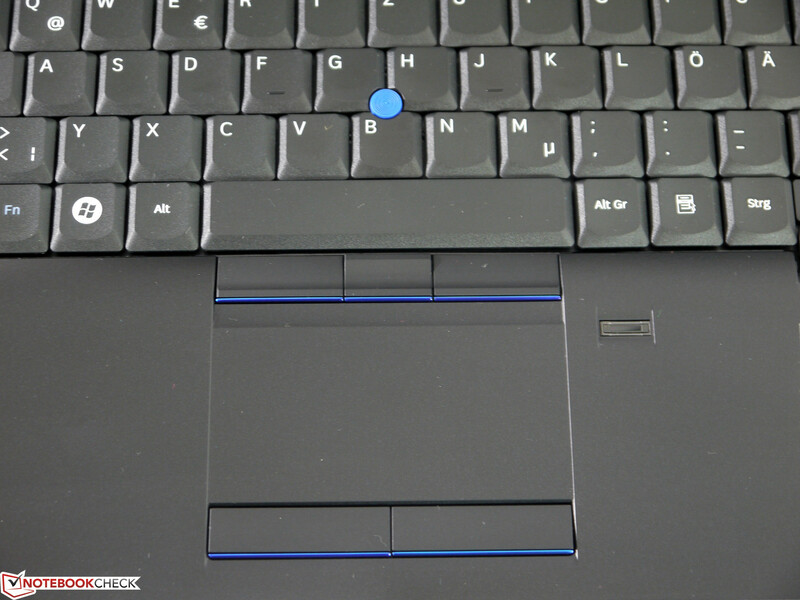 The blue rim on the touchpad keys won't appeal to everyone. The same is true for the lilac-colored hinge area. The rear does not sport any interfaces. It is a bit more cramped at the sides. The keyboard is very good but does not feature a backlight. The monitor ports' positioning is rather impractical. The webcam and microphones in the display bezel are perfect for video calls. The card reader is easy to access. Missing ports can be added via ExpressCard34. 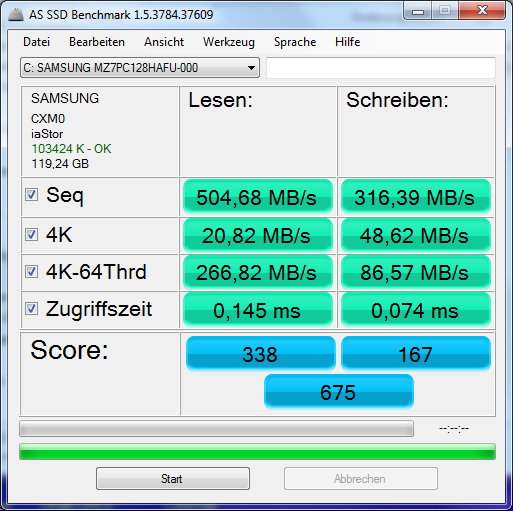 Samsung's 600B5C features eSATA in addition to USB 3.0.
and has a capacity of 66 Wh. and a large maintenance cover which conceals the most important components. The Wi-Fi module transmits in both the 2.4 GHz and 5 GHz bands. 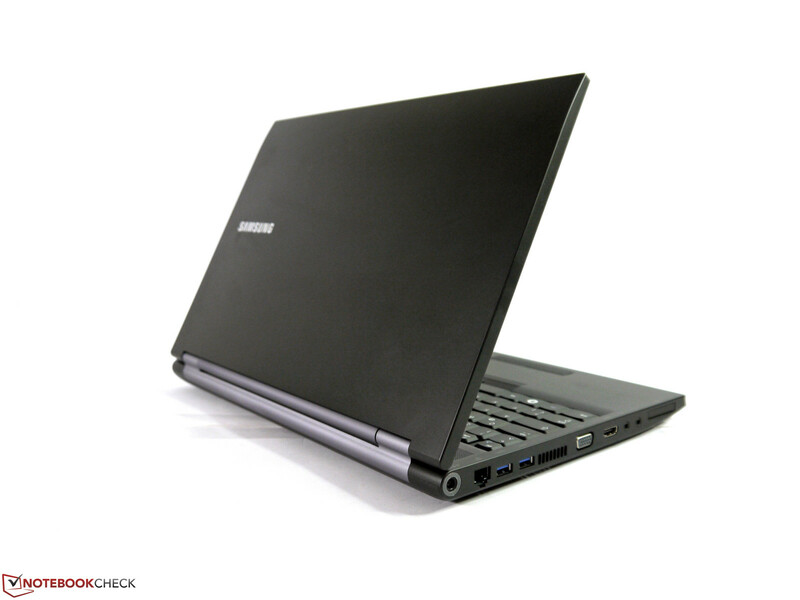 The solid state drive ensures a subjectively swift responsiveness. 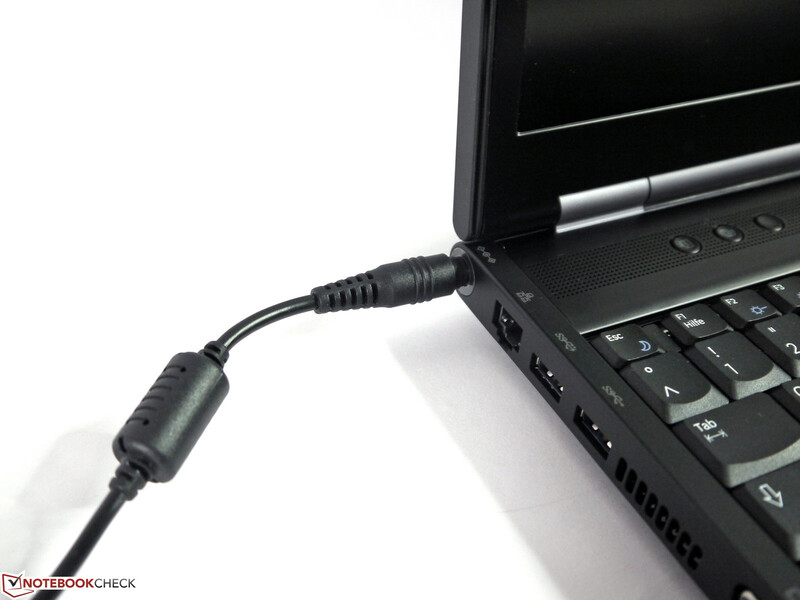 The docking port enables quickly connecting external peripherals in stationary use. 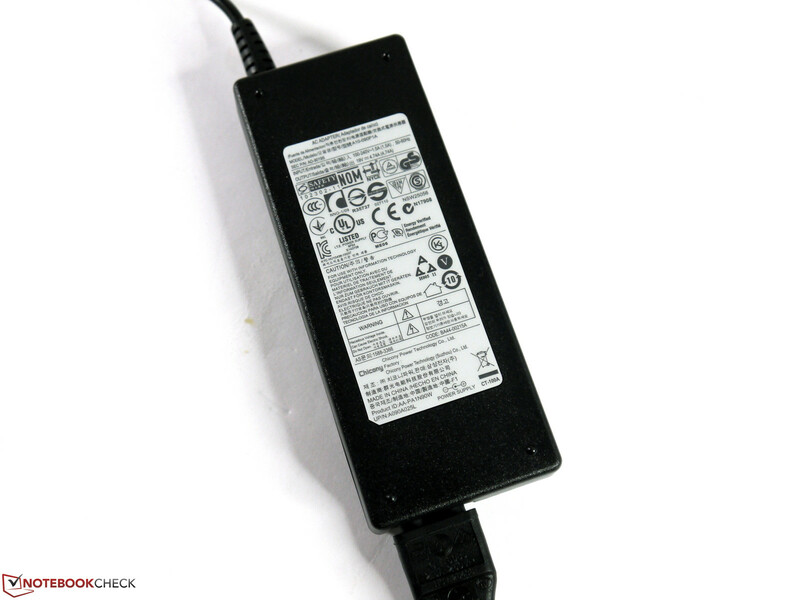 The power supply features a standard size and a nominal power of 80 watts. The power cord juts out to quite an extent and is a bit wobbly in the socket. The competition mostly demands a much higher price for the performance components that Samsung installs. The Silent Mode is a great unique selling point for noise-sensitive users. An appropriate screen with stable viewing angles and good contrast. We also missed optional configuration details like WWAN, keyboard backlight, mSATA, alternative removable drives, an FHD screen and quad-core CPU. That Samsung does not reach the level of the established competition despite many years of experience in crucial areas. 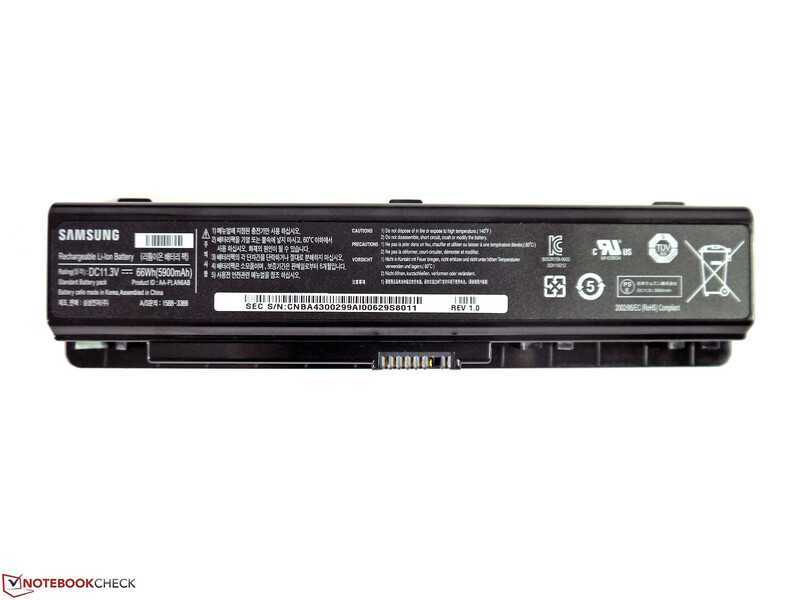 Lenovo ThinkPad T530, Lenovo ThinkPad L530, HP ProBook 6570b, HP EliteBook 8570p, Dell Latitude E5530, Dell Latitude E6530, Asus Pro B53V, Toshiba Tecra R950 and many more.